1 I will sing of steadfast love and justice; to you, O Lord, I will make music. 5 Whoever slanders his neighbor secretly I will destroy. Whoever has a haughty look and an arrogant heart I will not endure. 7 No one who practices deceit shall dwell in my house; no one who utters lies shall continue before my eyes. I read that and remind myself that far too often my heart knows too much of the evil of this world. Far too often I let Satan invade. This is a reminder for me that I need to keep him (Satan) out and make sure that I let Him (Jesus) in! The same with verses 5 and 7; rather than looking at someone else and seeing their slander and their lies, I will first look at myself and get rid of any temptations I have for gossip and slander, temptations to tell a “little white lie” instead of gently speaking the Truth. A word of caution to us all. It is clear that we can all interpret the Bible any way we choose to. Some will look at Psalm 101 and see that as clear evidence to continue their verbal attacks on those in charge. Others will read Psalm 101 and see it as clear evidence that President Trump is doing just what God is telling him to do. The simple fact is this: none of us know what God wants of President Trump, or if President Trump is even listening to what God wants to tell him. Remember the words of Jesus from Matthew 7, and remember them wisely — if you are judging others, how you judge them will be used to judge you. Can you stand up to that kind of judgment? I don’t think any of us can. Now, please continue reading, and praying with us our prayer requests and praises. First off, we have a praise report from Jodi: Received a letter from Chase today that the debit card fraud was indeed fraud, and the matter is finally settled. Whew! Thank you all so much for your faithful prayers! Trena had a prayer request and subsequent praise! PRAYER REQUEST: These precious girls have a BIG day ahead! They are hoping to become United States citizens TODAY!!! Our appointment/interview is at 9:00 (CST) this morning and we would greatly appreciate your prayers! I began the process with Julia 7 years ago this month. It will be so nice to have total completion of the process! The praise is that the process was a success, and they are now American Citizens! A quick prayer request for all of the anonymous prayer requests that are out there. The overwhelming number of them we never hear about, but it’s always a good reminder to pray for those that are unable to share their fears and concerns for whatever reason. Just remember them in your prayers, and know that God knows the details, and we don’t need to. Thanks everyone! We have a prayer request for our friend Tina — her heart surgery is scheduled for Thursday 2/2. Prayers please for her and for her husband Ted who is wheelchair bound. Some in the neighborhood are working on a schedule of providing some meals for them to help them out. Continue praying for Angela’s prayer request: Please keep my grandson Blake in prayer he means everything to me. A few months ago he had pneumonia and has not completely healed. He went to the Pulmonologist this week and it was discovered after a Pulmonary Function Test (PFT) that his total lung capacity was at 40%, which is alarming. We are all very concerned. Thank you in advance for your prayers. Angela tells me to please keep praying, Blake is still not fully healed! Please continue praying for Shannan’s prayer request: Prayer request that my previous agency owner will do the right thing and make right on the commissions she owes to agents. So far, nothing has changed. Please pray for the agency owner to do what is right. Continuing prayer request for Sheila: Prayer requests Jagan visted High Tech and Champs high school and loves both of them . Please pray she gets in and will have a choice on which one to pick. The only obstacle is its a lottery, however, I know with your prayers Jagan will get into both schools. Continuing prayer request for Robin: I have a co-worker/friend who knows a family suffering a tremendous loss. The oldest daughter died in an ATV accident, middle and youngest seriously injured. This occured yesterday and although the family knows Jesus this has rocked their world. Prayers deeply appreciated. We have a prayer request from Brenda: Hi Mike, would you please add our friend (and Susan’s husband) Ronnie to the prayer list? He will have open heart surgery on Monday to repair a leaky valve. Thank you. Love you. Lori has a prayer request: Pray for our Country; I am afraid this divide may become an abyss. I know as Christians we have nothing to fear but I still want to bring so many, many more with us. We’ve got much, much WORK to do! Continuing prayers for Caroline: My most precious cousin Angela has just minutes ago told me that her beloved husband David Rea has been diagnosed with a brain tumor. He is scheduled for surgical biopsy at Duke tomorrow and they ask for help in praying for a miracle. Her mother just died last month, and she is still reeling from that excruciating loss. Thank you for lifting up David at this dire time. It is a cancerous tumor, so please keep praying with a fervent pitch for God’s Healing Touch upon David. Robin had another prayer request: Please add Christy: she had knee surgery and she is diabetic. She has had issues with the wound and is now battling MSSA, not MRSA but very serious. Her aunt is in my bible study. Thank you. From me, praise for Stephanie and her family: Shane is home! Continued prayer request from Jodi: Please continue to pray for my father-in-law as he heals from a severe head injury, and please pray also for his wife as she is enduring a lot of challenge in this process. Continuing prayers for Amanda and her husband Daniel and daughter Cate. Here is what she wrote: My husband’s tumor indicators are still increasing after switching chemotherapy drugs. Please pray that this chemo at least stops the cancer from spreading and growing but better yet that God cures and heals him. Please pray for his emotional and spiritual well being as well. He’s taking it pretty hard even though it’s only one indicator and isn’t always correct. There are several new treatments coming in the next several months and we need to keep the cancer in check at least until then! Thank you all so much! The romance at Walt Disney World is evident in many of the great dining establishments that you can experience. Today, though, I’m going to focus on what I believe is the pinnacle dining location — inside Cinderella Castle — as we talk about the romance you can experience at Cinderella’s Royal Table! Welcome to this month’s Blogorail Orange Loop. 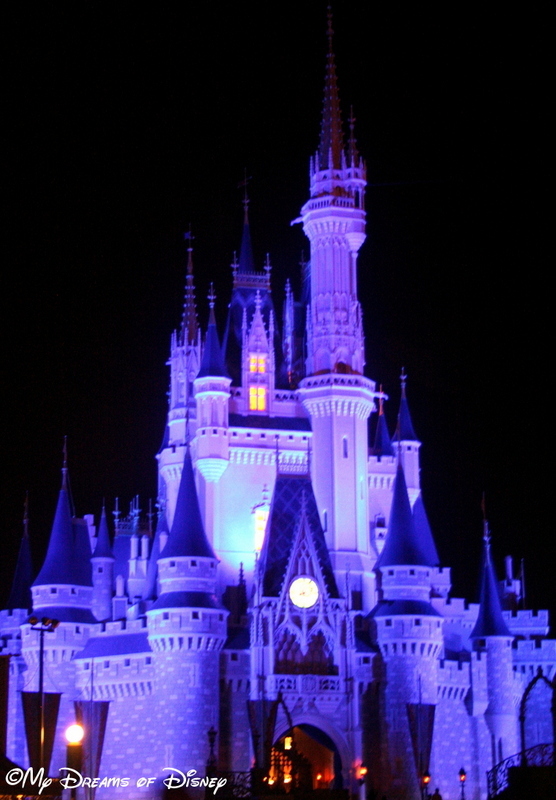 Over the years, my wife Cindy and I have visited Cinderella Castle many times. Contained within the iconic structure is Cinderella’s Royal Table, a signature dining restaurant upstairs in the Castle. While most people think of this as a great character meal to enjoy with their children, there is a case to be made for why this is an incredible romantic Disney restaurant. Let’s dive into the details below! Like I mentioned, most people are used to pictures like this one when they experience a meal at Cinderella’s Royal Table. Today, of course, most of those characters are going to be Princesses, but you get the idea — for most people, Cinderella’s Royal Table is for their kids to eat inside the Castle. Therein lies the rub, though. What more romantic setting can be found for a romantic Disney experience? In this blogger’s opinion, eating inside Cinderella Castle is at the top of my list for romantic spots at Walt Disney World. The location, the food, the whole idea of eating in a grand dining hall overlooking your “Kingdom” — well, the romantic in me just thinks that is absolutely perfect. 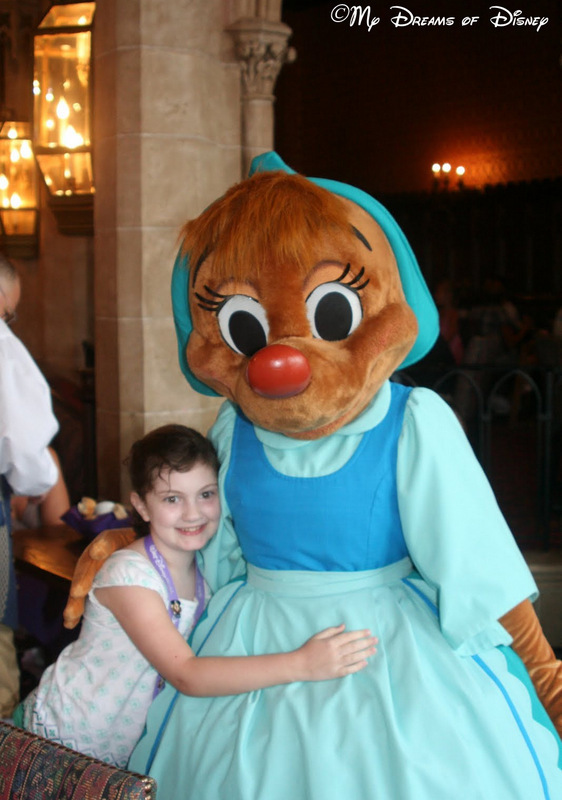 On June 13, 2012, we were part of a large group dining at Cinderella’s Royal Table. We had a table for 9, which included 5 adults and 4 children — not at all your typical romantic setting at all. 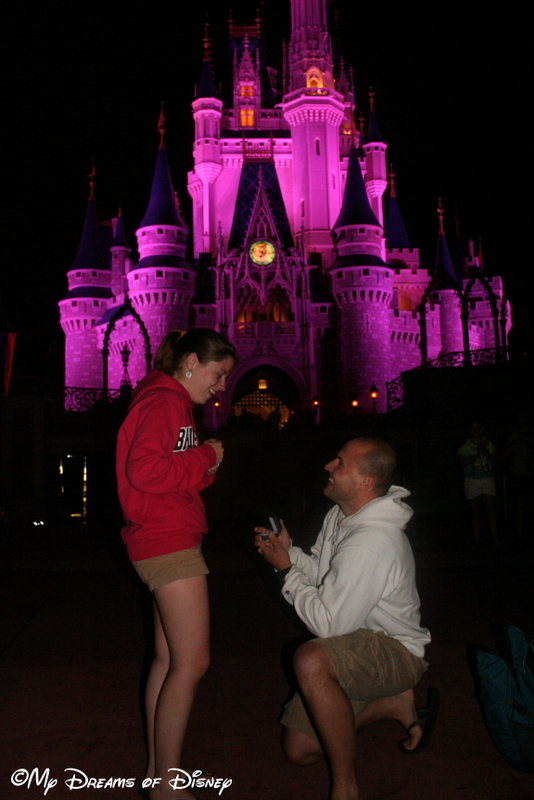 What made this a special night, though, was that we happened to be inside the Castle when Wishes was set to start! We were able to enjoy the fireworks from the show while watching through the windows, and the show music was broadcast into the restaurant, so we never missed a beat. All of a sudden, what started as a big group party of 9 turned into a truly magical, romantic Disney experience for myself and my wife Cindy. I could go on and on about all of the romantic moments from my days eating in the Castle. There was the day that Cindy and I — while we were eating our way through Disney while pregnant with Sophie — stopped at Guest Services that morning in January, 2001, and got a reservation for the Castle that day at lunch. Of course, not all romantic Disney moments happen inside the Castle at Cinderella’s Royal Table. I was fortunate to be able to witness this special moment, just feet from the restaurant. While this certainly doesn’t qualify as part of our look at Romantic Disney Restaurants, I hope it does convey to you why I think Cinderella’s Royal Table qualifies for me as a romantic Disney restaurant. Have you ever had a romantic Disney experience at Cinderella’s Royal Table? Please share if you have, and thanks for stopping by! 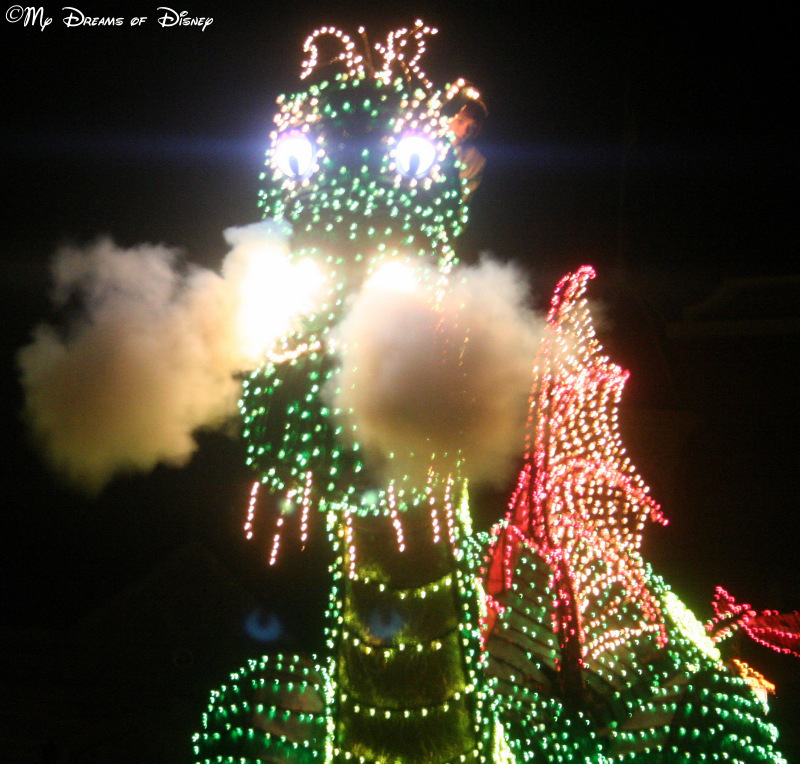 The Main Street Electrical Parade is the subject of this week’s Wordless Wednesday post! Welcome to the return of the Wordless Wednesday Blog Hop! 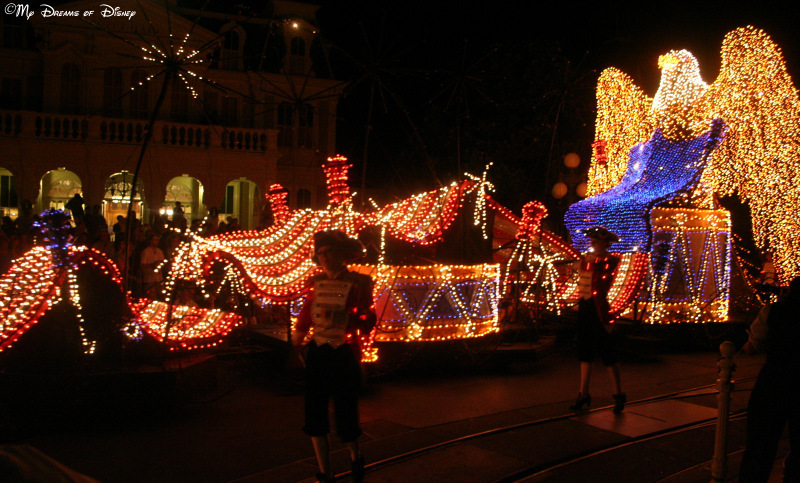 Today we are focusing on Disney Parades for our theme! My friend Deb from Focused on the Magic has always hosted this, and I used to be quite the regular on contributing. Things shifted, though, and I was not able to contribute nearly as often as I wanted to — that is, until now! Long time readers will know that my Wordless Wednesday posts are not wordless at all usually. 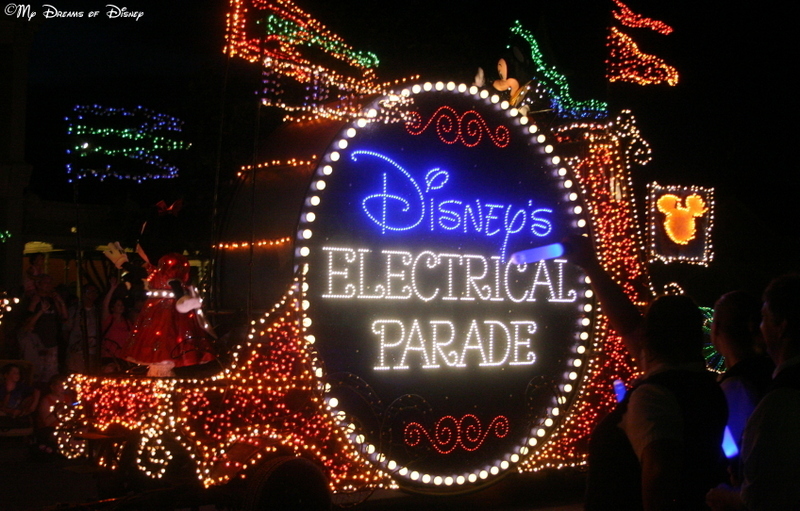 Today’s theme is Disney Parades, and I can’t think of a better parade to feature than the Main Street Electrical Parade! 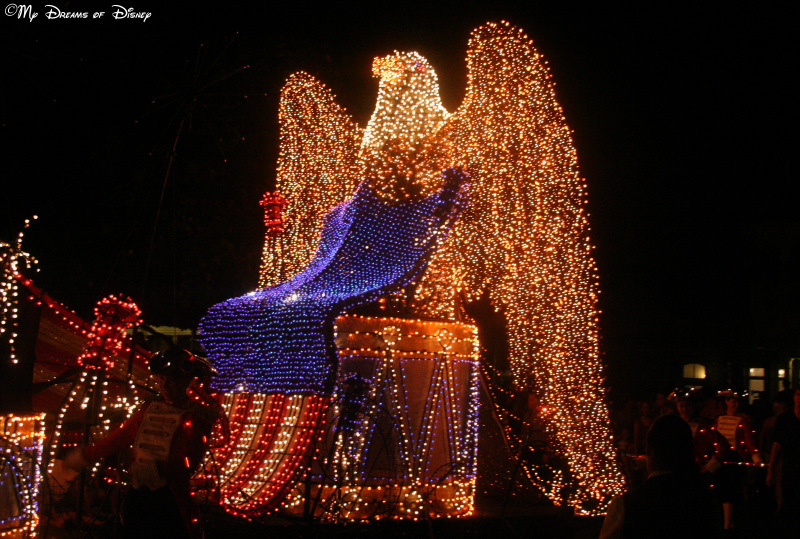 Originally from Disneyland, brought to Walt Disney World for several years, and now, back at Disneyland where my friend Sheila says “it belongs!” I’ve great memories of this parade from it’s days in Florida, here’s some of my favorite pictures from that incredible parade! Enjoy! 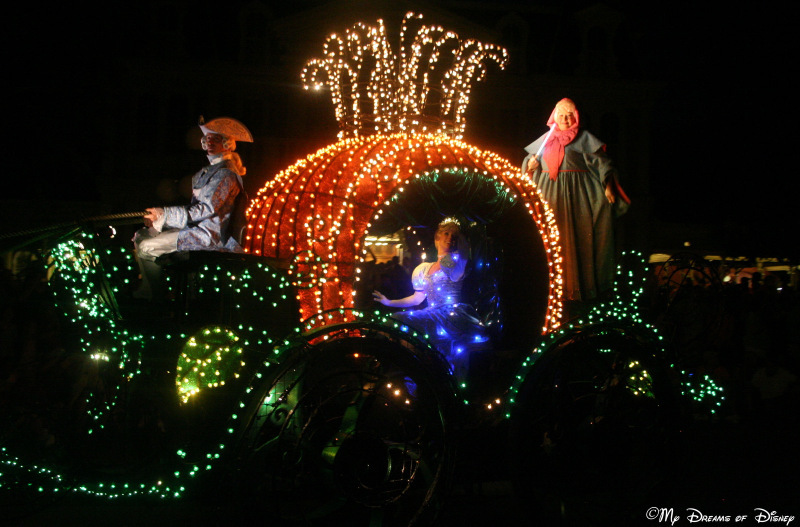 It looks like Cinderella is looking right at me! To Honor America, a beautiful ending to a great parade! The symbols of our country, the Bald Eagle and the American Flag. Thank you for joining us for this week’s Wordless Wednesday post! We’ll see you next time — until then, click on the image below to see the rest of the entries! My friends, welcome to this week’s Prayers for the Week post. Today we are talking about when God answers our prayers. Sometimes it is fairly quickly, sometimes it takes longer, but God always answers our prayers. The answer is not always what we want it to be, but it is answered nonetheless. For this week, we actually have several answered prayers that we want to give praise to God for, so let’s get right to it! Jodi has an update on her Father-in-Law from her prayer request of last week: *1/16/17 update: Gerald was discharged from the hospital yesterday! He will receive therapy at home and have daily nurse visits. Please continue prayers for complete healing, that the cause would be revealed, and for Elaine to have patience during this time. And, of course, lift shouts of praise for his rapid improvement! Thank you!!! Jodi also had a prayer request for her son Kyle and his job interview, and we have an update on that as well: Kyle got the job!!! Starts next Tuesday (24th). Thank you so much for praying over him! Jodi also had an answered prayer regarding the person that shot the police officer in Orlando: They got him! Thank you, again, for your faithful prayers! I found out from Leslie that Meg is doing well, they find out the results of the testing on Monday, but Meg is much better. Please continue praying for the prayer requests we had from last week. There were a lot of them, please keep lifting them up to God. Here is the post in case you need to read and pray them again.